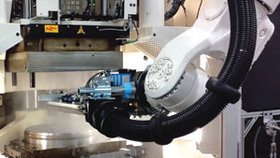 A view of the robot during the stripping phase of production of the pharmaceutical stoppers. BARTLETT, Ill.—It would be difficult to say that Rep International has a secret to how it has globally increased sales by 10 to 15 percent annually in recent years. According to Tim Graham—president of Bartlett-based Rep Corp., the firm's North American affiliate—the closest thing to developing a secret was the strategy of altering its sales and service philosophy. Yet the technological advances have been impressive as well. Rep International, based in Corbas, France, has been selling injection molding machines since 1948. It brands itself as a provider of exclusive solutions with an international network of sales agents. Its products focus on a range of high-tech vertical and horizontal rubber injection molding machines. The proof is in the results, and Rep has them. The company has registered strong growth along with making multiple investments, including the launch of production facilities in India (Rep India) and China (URP Machinery), as well as the development of new machines specially designed to better match emerging Asian market requirements. These growth efforts in India and China will expand in 2015 while the development of the G10 range of rubber injection molding machines—the focus segment of the Rep brand in Western Hemisphere markets—will continue. Rep plans to display a G10 machine at the ACS Rubber Division's International Elastomer Conference and Rubber Expo this October in Cleveland. The dual-compound CMS machine is today a standard injection press with four rotating stations and two injection units allowing for the synchronous curing, stripping and injection of two compounds into the same mold. This has replaced the compression method that requires a significant amount of prep work. The result is a more efficient rate of return for rubber product manufacturers, Graham said. 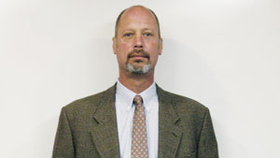 Tim Graham, president of Rep Corp. Using Rep technology, the firm said its customers can benefit from added productivity from a CMS machine by limiting the number of cavities per mold, thus leading to a better control of the material flow inside the cavity. Equipping an injection molding machine with a second injection unit has been a viable production technology for Rep on all types of machines, dating back to the G7 generation, Graham said. The goal with this new technology is the combination of technical performance at optimized cost. To provide more detail, the elimination of secondary assembly operations and integration of a low-cost compound into a part are thereby achieved, thus limiting the quantity of higher performing and higher cost compounds only to the functional sections of the molded part. For example, Rep was able to help a producer of pharmaceutical stoppers provide a turnkey solution for manufacturing the stoppers on injection molding machines in a controlled atmosphere. 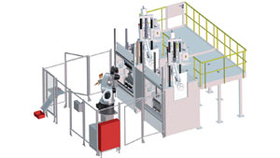 The injection-compression molding solution proposed by Rep comprised producing the stoppers on two fully-automated, four-station CMS-type machines equipped with eight molds total. Thanks to the injection-compression molding on the two Rep CMS machines, the customer now can produce 41,880 parts per hour with a machine cycle of 71 seconds. Production costs and material waste have been reduced significantly. Rep has achieved significant growth in the pharmaceutical market largely because it has developed procedures to help overcome some of the more stringent challenges to injection molding, according to the firm. Problems such as air encapsulation, marks and burned spots are very critical on the bottom of the cavities where material compacting sometimes is difficult. Pharmaceutical stoppers are generally molded on compression molding presses with big platens and several stages for improved productivity. A 3-D view of the comprehensive installation of the system Rep supplied. While Rep has shown growth in other markets, Graham estimated that more than 80 percent of the machinery maker's business lies in the automotive industry. While new processes can help balance the industry reliance, automotive is in a high growth phase now, and “when you're in that industry and it's growing, it takes away so much of your focus,” he said. Yet any technical advantage Rep promotes is not the only way that Graham wants to differentiate his company. Those aforementioned perceptions are that an injection molder is just about selling product and not being a true partner or resource to its clients. Graham has made it a priority to hire professionals on the sales and service side who want to understand the process side of injection molding. He is seeking balance between profitable growth and being that resource for clients. Rep has seen growth in such suppliers as gaskets and seals, window sealants and more. Some of these philosophical and business changes that Graham has instituted are related to the fact he is “a few years away from retirement” and because he wants to position the company for future success in the long term. “We're trying to look at things differently,” he said.